I'm long overdue for another Sneakers+Life post. Every time I post or share something sneaker related on IG, I get lots of DMs asking where, how, and are they custom. I'm gonna share a lil' secret with y'all - none of my sneakers are custom made (yet), and the majority of them were purchased with some sort of discount. That's right - ya girl lives for a good sale. Especially on sneakers and workout gear - but that's another story (workout gear). Now this tip won't apply to everyone. But if you wear up to a size 9 in women's, for the most part you're able to get the same or similar shoe in grade school sizes for $20-60 cheaper. This is how I come by every single pair of Jordans I own. To figure out your size in kids/grade school, simply subtract 2 from your women's size. Depending on the shoe in women's, I wear an 8.5 or 9. In kids/grade school, I wear a 6.5 or 7. If you wear larger than a size 9 in women's, then I'm afraid this tip won't apply. No worries - there are 7 more ways to get your goodies at a discount! ...unless you absolutely MUST have the shoe, on that day, and fear they will sell out with no restock in sight. To date, I've only made the effort to get one shoe release - the Space Jam 11s. My original plan was to order them online, but literally every sneaker website was crashing. So I hopped out of bed and made my way to the Footaction/Jumpman23 store, and got told I had to wait until 2pm to purchase my pair (mind you, it was before 9am). Not one for the shenanigans, I moseyed my way down to Kids Foot Locker, and put tip #1 in motion. I requested a size 7 and was in and out in under 10 minutes. 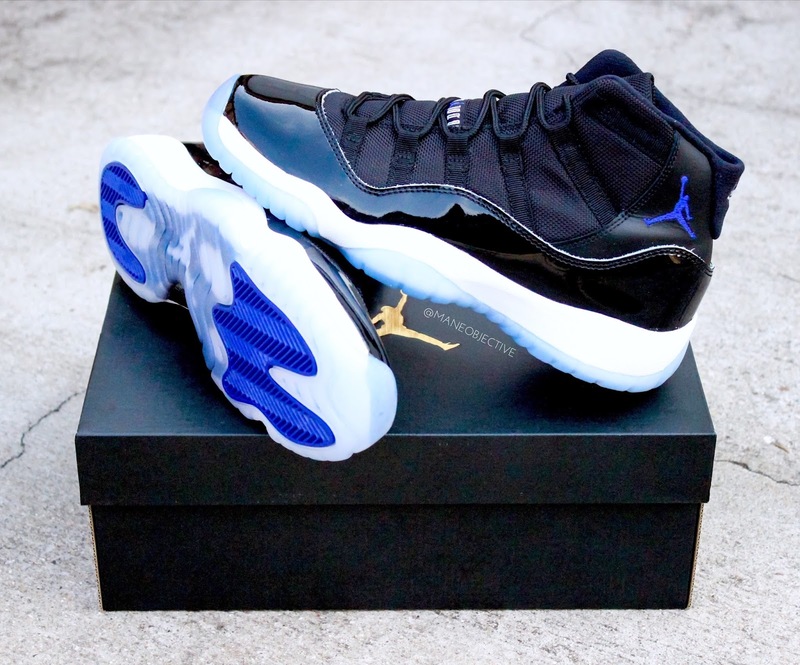 Jordan | XI "Space Jam"
Barring any extreme situations like the above (by the way, my $140 jams are now being hawked on various sites for $325), it's often times worth it to wait. Because new shoes are released almost every week and weekend, a bit of patience will probably pay off. If you're willing to wait it out, you'll find your coveted sneaker price drop by up to 50%. 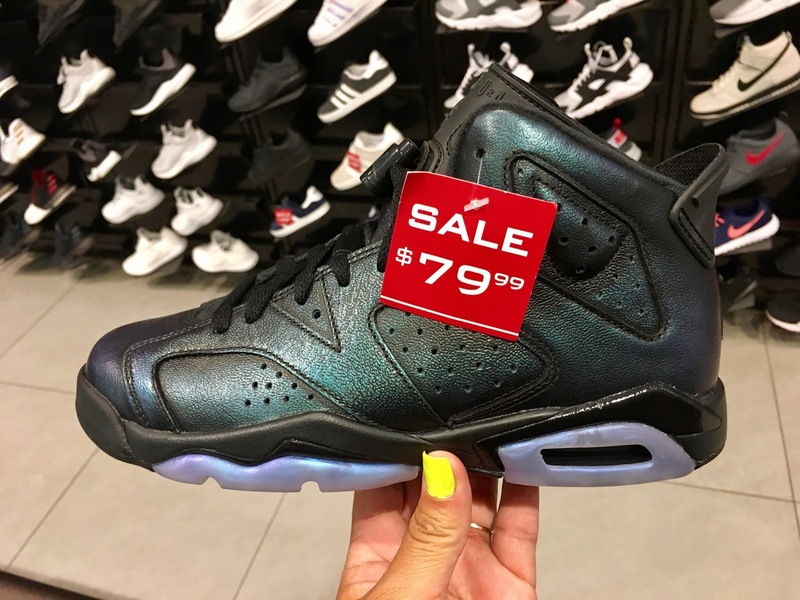 I spotted these Jordan VI "Chameleon" sneakers in Maryland. Original price - $180. I shoulda got 'em then. The best time to buy summer gear? Fall. The best time to buy cold weather attire? Spring. Just like clothing and home decor, sneakers are seasonal. With each season change, you've got the chance to score the pair you've been eyeing - at a discounted price. And if you happen to catch a sneaker store during a seasonal blowout/sale, you can often score an extra 20-30% off the already discounted price. I have more reward card sign-ups than probably should be allowed for one person - from Best Buy to Vitamin Shoppe. Somewhere in the alphabet soup of rewards memberships, I'm a proud holder of rewards memberships at FinishLine, Footaction, and Footlocker - all of which send certificates/coupons for reaching a certain threshold of purchase. For example, FinishLine sends $20 certificates for every $200 spent. All of them send at least $10 certificates for your birthday. 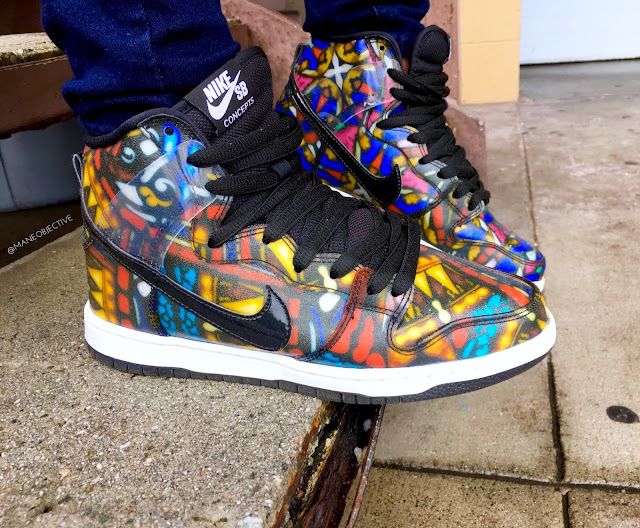 Nike SB+Concepts | "Stained Glass" aka "Holy Grail"
Most of these competitors price match each other - just show proof that a similar retailer is shelling the same shoe for less. You can also try your hand at boutique shoe stores and skater shops, who are often anxious to clear inventory and will undercut the pricing of the big-name shoe store next door by $20 or more. I haven't had much luck on this route, but I haven't put in the time that other folks have to come up in a real way. But the truth is, the further out you're willing to go, the better your chances are at a score. 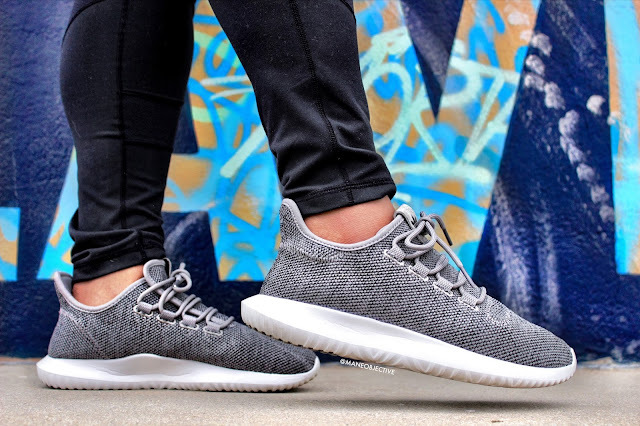 Try your luck at Nike Factory/Outlet stores, Ross, TJ Maxx, Burlington's, and Marshall's - you just might be surprised with what you find at a price that's almost too good to be true. Check out this Instagram account dedicated to outlet hunters to see what I'm talking about. The truth is, you don't have to build your sneaker collection in a week. Or even a month. Or a year. I've been building my collection for years, at my own pace. Sometimes, it seems like I'm adding a new pair of sneakers monthly. Other times, I go several months without a new shoe. I'm not in competition with anyone to build a shoe collection. Take your time, and build at your own pace. Some people buy sneakers just to buy them, or because everyone's buzzing about them. These people are called hypebeasts. I don't hypebeast. 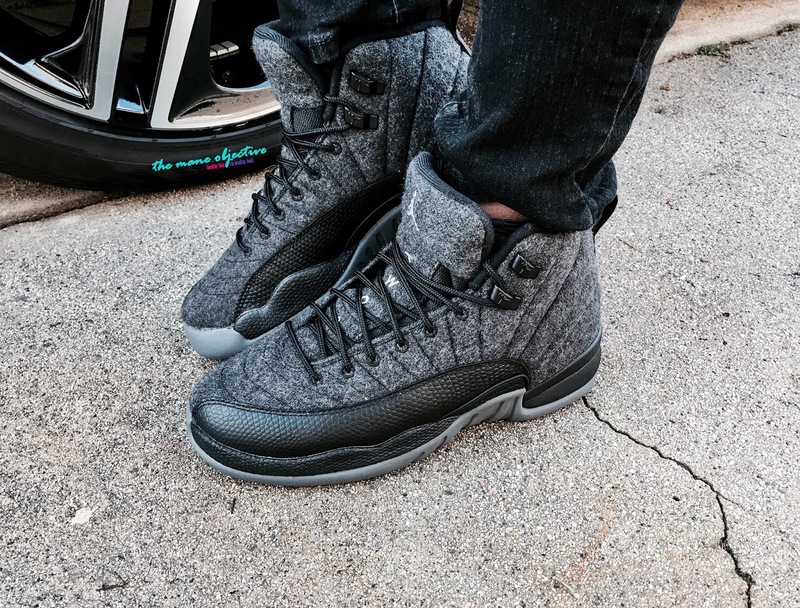 Hypebeasting costs a lot of money - just ask anyone with a pair of Yeezys or KAWS collab Jordan IVs. 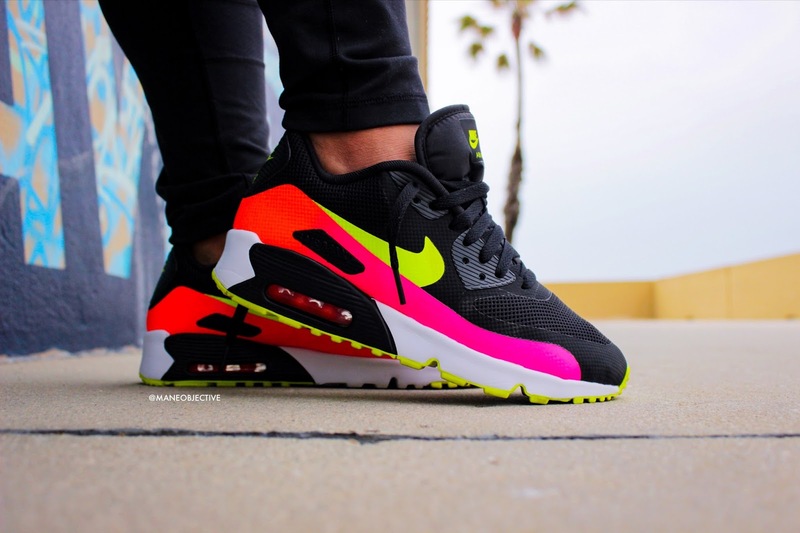 Don't get me wrong - some of these shoes are dope. But I draw the line when sneakers start costing more than my DWP bill (water+electricity+trash for those of y'all not in California). I don't buy sneakers to flex on Instagram, or impress people as I walk around the mall. I buy sneakers to be comfortable, and because I like them. As a result, I end up spending a lot less money than some of my fellow sneakerheads/hypebeasts - because I know when to pass. I don't care who designed what, how limited of a release it is, or how "valuable" they might be later - an ugly sneaker is an ugly sneaker. And I don't wear ugly sneakers. I hope you guys enjoyed this sneaker post! Got any questions about sneakers? Leave 'em in the comments below! I've recently found a service who did write my paper for me, so click on a link to check for yourself! Thank you so much for writing this post! 123helpme displays advertisements in which lead the reader to believe that their business is a solution for the person that is looking for a completed, high quality essay, or paper. If you seek information about “123helpme premium account”, welcome to Scamfighter.